Digital Surrogates from the President E. James General Correspondence contain digitized typewritten letters, speeches, handwritten letters, telegrams, and event programs, related primarily to the visit of the Chinese ambassador to campus and his speech in the 1908 commencement ceremony, students sent to the University by the Chinese government, the Chinese Students' Alliance, a proposal for sending and Educational Mission to China; as well as relating to the Crocker Land Expedition and the contribution of the University to its realization. Relevant correspondents include President Edward James, Chinese Ambassador Wu Ting-Fang, President Woodrow Wilson, W. Elmer Ekblaw, and Edmund Otis Hovey (American Museum of Natural History, New York City). Original materials can be found at record series 2/5/3, boxes 10, 17, 31, 32, 43, 61, 80, 114, 140, 153. Additional information related to the Crocker Land Expedition can be found in record series 15/1/812; 15/11/21; 26/20/153; and 43/6/808. 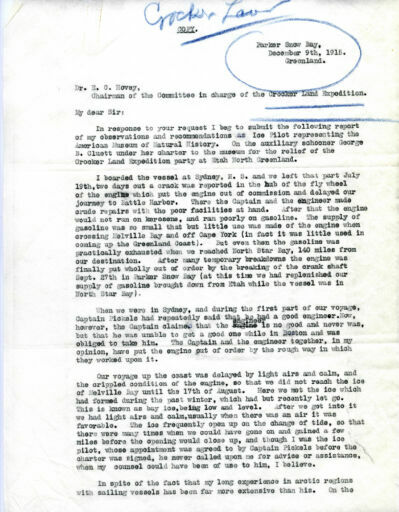 The President E. James General Correspondence (Digital Surrogates), 1908, 1912-1918 are managed by the University of Illinois Archives and do not feature precise descriptive information for each item. Discover their contents by browsing the folders and files. For more information, contact an archivist at illiarch@illinois.edu.